Superbowl Party crowd pleasing wings every time! It is not hard to make good wings. The chicken and the farmer have already done the hard part. If you choose plump, juicy wings and prepare them properly it is pretty hard to mess them up too badly. 2) USE THE RIGHT OIL- If you are frying your wings (medium heat), use the right oil. Use peanut (my favorite), canola or vegetable oils, because they have the high smoke point that will ensure crispy skin. This will seal in the moisture and guarantee the meat is cooked thoroughly. 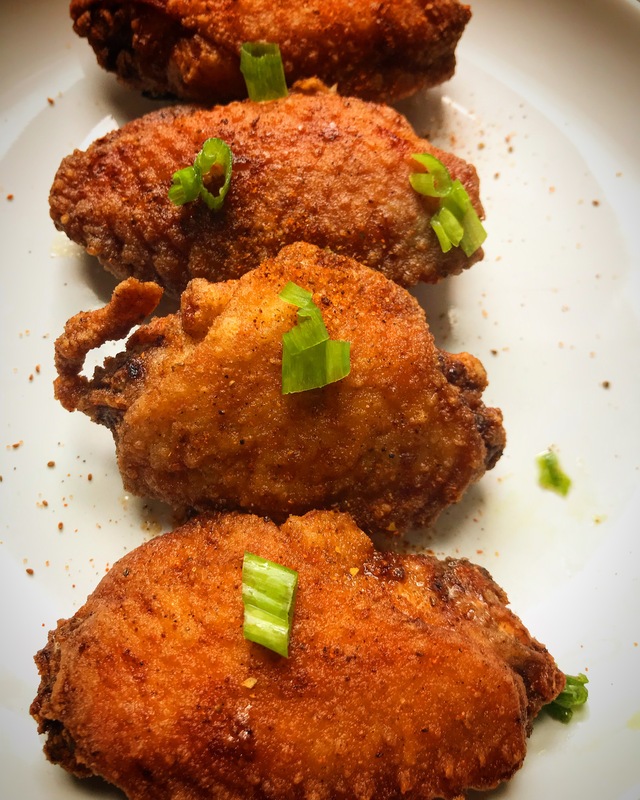 3) NO FRY, NO PROBLEM- If you hate frying but want crisp wings, we have two options for you. BAKED- The wings are tossed with a tiny bit of baking powder (not soda!) in your coating to alter the PH of the skin, making them get crispier than ever. SOUS VIDE BBQ- The sous vide method of cooking is amazing for locking in flavor and assuring a well cooked wing. They are fully cooked when you hit them with a finishing sauce or rub and grill them for a crispy coating. 4) SEASON WITH REASON- For fried wings, dust with flour and seasoning before cooking. Don’t over season at this point. Let them sit for ten minutes before frying to let the skin bond with the coating. 1/2 cup cold unsalted butter. 1 1/2 tablespoons white vinegar. 6) DIPS-Wings are made for dipping. Whether you’re on team ranch or team blue cheese, make sure your dip is delicious. Choose a store-bought brand that you really love the taste of (I like Marie’s). Easy to make your own. 1 small clove garlic, chopped. 1 tablespoon milk or buttermilk.